If you're on the hunt for the dress, you have a lot of factors to consider. Before you even step foot into a bridal boutique, start by finding out the most flattering types of dresses for your body type. Then, go a step further and consider what kind of shapewear will work with your body and your dream dress. You'll save yourself a lot of time and hassle this way…so you can finally relax about the dress and move on to planning the rest of the wedding. If you are tall and lean, with minimal curves, your ideal dress should help create curves. A gown with contouring seams can create an illusion of curves so that your silhouette looks more like an hourglass. You'll also benefit from a curve-boosting shaper like the Corselette by Amia, which pulls in your midsection while lifting your bust and your rear. With your coveted shape, you will want to emphasize that narrow midsection. Belts and other waistline details, as well as fit-and-flare looks can highlight your enviable curves. Your shaper should provide a smooth foundation for your midsection, rear and hips. The Vedette Gitta Strapless Bodysuit with Front Closure works beautifully with a number of hourglass styles. 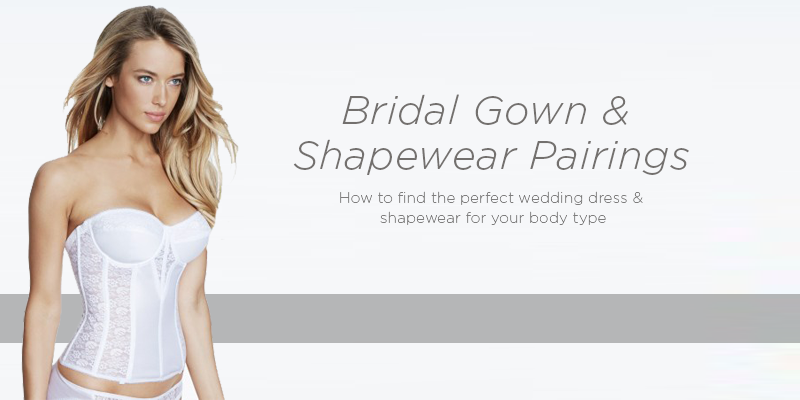 If you have broad shoulders, the key to looking gorgeous walking down the aisle is finding balance in your shape. A voluminous skirt on your dress can do just that. If you're not interested in the ball gown look, you may want to try a flirty short dress instead. When it comes to shapewear, again focus on finding balance. Choose a garment that minimizes your waist and enhances your rear such as the Ann Chery Alexa High Compression Bodysuit. Your challenge as an apple shape is finding balance and creating more of a waistline. A-line cuts are always flattering, just be sure that the bottom half of your gown is balanced with the top. For shapewear, a waist-minimizing garment like the Satin & Lace Torsolette By Dominique will slim your middle dramatically. Curvy hips can look phenomenal in the right dress. Choose a cut that emphasizes your natural waist and draws attention to your top half for balance. You'll want shapewear that keeps your curvy hips and thighs smooth and under control, particularly if you choose a figure-hugging gown. We recommend the Mid-Thigh Bodysuit by Amia. Remember that there's an ideal look for you. For more ideas, check out our bridal collection.